Make your own easy to use, sturdy and stylish potluck casserole dish carrier using this do it yourself pattern and instruction manual in PDF format. Holds hot or cold dishes and is designed to carry a 9x13 dish (approx 23cm x 33cm) or comparable sized square, rectangle or round dish. Based on one of my gramma's patterns, it's perfect for taking hot or cold dishes to parties and gatherings and a great gift idea too! Easy to use... Open the flaps and set your dish on the center base... Fold each flap over your dish, and engage Velcro strips... Then grab the handles and you're ready to go! Easy to store... Folds flat for easy storage. Folded carrier is approx 10" W. x 12" L. x 1" H. (25.4cm x 30.5cm x 2.5cm). 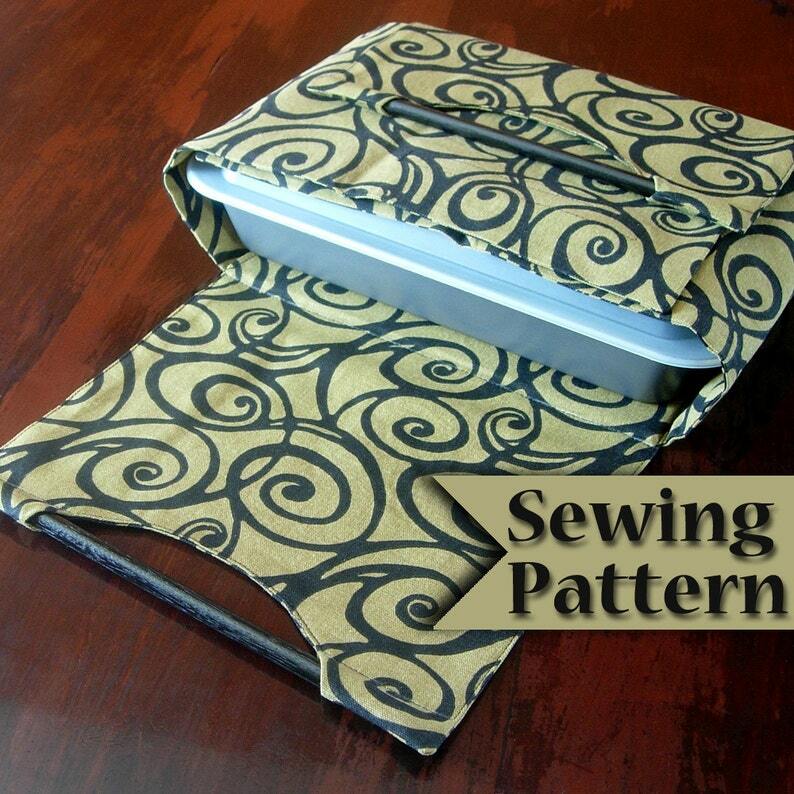 Designed for intermediate level sewing and takes 1-1/2 to 2 hours to make. Computer generated pattern is easy to assemble and newly designed, detailed manual includes easy step-by-step instructions with over 60 photos and diagrams. Pattern pieces and manual are written in English with metric conversions. If you would like a PRINTED VERSION of this pattern MAILED to you, please contact me and I'll give you the details. •Pattern and manual are digital. •When purchased will be available to you in PDF format after payment received. ••the second file is the same file broken into 18 letter size pages which can be printed on your personal printer and taped together. If you have any questions while you are sewing, please feel free to contact me. I’ll help you as best I can. Due to the nature of this product, no returns will be accepted nor refunds will be given. This pattern and manual have been created for personal, at-home use only. Products created using this sewing pattern may be sold, but factory/mass production is prohibited. If selling products online, please include design credit “pattern design by TiffinyDesigns” and link to my store in your listing and/or description. Replication and/or distribution of any and all aspects of this PDF sewing pattern and manual are strictly prohibited. Well written instructions, nice pattern layout. The two kits look very doable and the directions are plentiful and clear. Cannot wait to finish these! I also accept most credit cards through Etsy's direct checkout. If you pay with an e-check I will not ship your item until the check is cleared and confirmed from Paypal. Please remember that everything here is handmade and there will be irregularities and tiny flaws in the materials used and in the construction. And depending on your computer monitor, the colors viewed may or may not be accurate. With those things in mind, if you are unhappy with your handmade item, please contact me within 5 days of receiving your item and we will work something out. Should we agree on a return and refund, the cost of the product only will be refunded, not the shipping. I can only accept returned items that return to me free of odors (cigarette, perfume, pet) and in saleable condition. Thank you for your understanding. Because of the nature of patterns, there will be no returns accepted nor refunds offered on my PDF patterns and tutorials. I love custom orders and am happy to hear your special requests. Feel free to contact me through the etsy message system. Custom orders may incur an additional $5 minimum charge for the extra time it takes to plan and make.